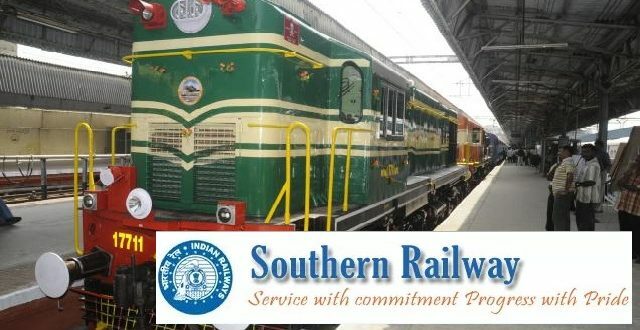 Southern Railway Recruitment has announced for various role. It has announced for various role such as 737 Fitter, Welder, Machinist, Electrician, Mechanic Diesel, Mechanic Refrigeration & Air Conditioning, Electronics Mechanic & Programming and System Administration Assistant Posts. Now check below all details. Find here all details such as eligibility criteria, Offline registration processes, payment of prescribed application fee/intimation charges, Southern Railway pattern of examination, Southern Railway Syllabus, Southern Railway Question Paper, Southern Railway Admit Date Release Date, Southern Railway Exam Date, Southern Railway Result Date. check below all details. 1. Fitter, Painter & Welder - Should have passed 10th Class under 10, +2 System of education or its equivalent. 4. Medical Laboratory Technician (Radiology, Pathology, Cardiology) - Should have passed 12th Class under 10, +2 system of education with Physics, Chemistry and Biology. The upper age is relaxable up to 3 Years for OBC candidates, 5 Years for SC/ST candidates and 10 Years for Persons with disability (PH). b) A crossed Indian Postal order for Rs.100/- ( Rupees Hundred only) drawn not earlier than the date of issue of this notification (Not Refundable) drawn in favour of the WORKSHOP PERSONNEL OFFICER, CARRIAGE AND WAGON WORKS, SOUTHERN RAILWAY, PERAMBUR, CHENNAI - 600 023 and payable at CHENNAI should be enclosed along with filled in application towards Processing Fee. Applications without the processing fee, will be summarily rejected. c) SC/ST/PWD/Women Candidates are exempted from the payment of Processing Fee. 6. Hard Copies of the signed application (registered online) along with photocopies of (i) ID proof (ii) Proof of Date of Birth (iii) Educational Certificates: Mark-Sheets/Degree Certificate (iv) Caste and attested copies along with enclosures in a cover super scribed as “APPLICATION FOR ENGAGEMENT AS ACT APPRENTICE – COMBINED NOTIFICATION NO. 1/2017 /Act App / CW /PER’’ may be sent to the WORKSHOP PERSONNEL OFFICER, OFFICE OF THE CHIEF WORKSHOP MANAGER, CARRIAGE AND WAGON WORKS, SOUTHERN RAILWAY, AYANAVARAM, CHENNAI-600023 by ORDINARY POST ONLY. Along with the filled in application, attested copies of the following should be enclosed. b) Attested copy of certificate in proof of Academic qualification in case of Fresher’s & MLT. c) Attested copies of certificates in proof of Academic and Technical qualification ( ITI certificate issued by SCVT/NCVT ) in case of Ex.ITI. d) In the case of candidates belonging to SC/ST/OBC, Community certificate in the prescribed format issued by the competent authority, not below the rank of Tahsildar in the case of SC and RDO in the case of ST. OBC certificate should specifically indicate that the candidate does not belong to Creamy Layer. e) Disability certificate issued by competent authority in the case of Persons With disability (Physically Handicapped candidates). f) Proof for Employment Exchange Registration.Attested copy / Online Registered copy of Employment Registration Card should be enclosed. SC/ST candidates and wards of Serving/Retired/Deceased Railway employees are exempted from submission of Employment Registration Card. g) The wards of Serving Railway employees should get certification from the immediate supervisor in the application form. In the case of wards of Retired/Deceased Railway employees, the attested copy of Service certificate should be enclosed.